Determining your trade show staffing needs correlates to the size of your booth, relevancy of the audience attending, and type of event in which you are participating. According to research by the Center for Exhibition Industry Research (CEIR), an estimated 16 to 20 percent of attendees will have some level of interest in your product or service. To begin using your staffing formula, ask the conference sponsor for an estimated count of how many people are estimated to register, and in turn, visit the trade show floor during the span of the event. 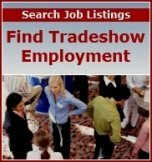 With this information in hand, follow the steps below to determine your trade show staffing requirements. Calculate the total number of potential prospects you expect to see by multiplying the number of registered participants by 16 percent. This is a conservative approach. You can choose to multiply by 20 percent if you believe your booth, products, and marketing visibility will be a significant factor over competitors. Take the number you arrived at in Step One and multiply it by 50 percent, if the event in which you are exhibiting is more general in nature and will attract a wider range of attendees. Use a number between 35 and 40 percent if the show is highly targeted to your specific audience. Use the calculation from Step Two and divide the number by the total hours your booth will be open, according to the conference schedule. The number you get will show you how many people will potentially visit your booth every hour. Divide the visitors per hour from Step Three by the number of contacts or demonstrations you think your personnel can effectively handle in a 60 minute span of time. Then, you will be able to project how many people you need to staff your booth at any given time during the show. Once you have used your staffing formula and have determined your personnel needs, make sure your exhibit area is large enough to accommodate everyone who will be working. As a rule of thumb, your representatives will take up about 30 percent of the space to accomplish their objectives, or about 50 square feet per person.